Struggling to put your favourite apps, music or photos on your iPhone or iPad? Hidden clutter may be the culprit. AVG TuneUp® will find and clean up the junk on your iPhone, iPad or iPod touch® in three simple steps (iOS 8.2 or below). Download, install, and get ready to clean your device. Download AVG TuneUp, featuring our all-new AVG Cleaner for iOS®. Simply double-click on the downloaded file and follow the onscreen instructions to install. After launching TuneUp, you will be greeted by the 1-Click maintenance. We recommend you run it, but you can skip it by closing the window and moving on to the main dashboard. 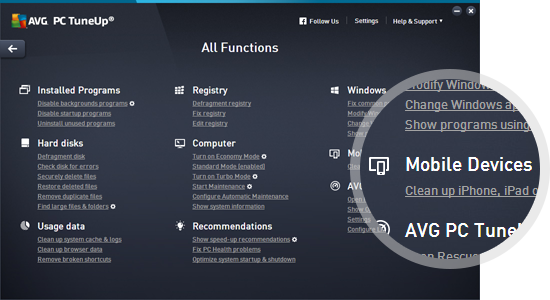 Once there, click on the All Functions tile. Aborted downloads, app caches, corrupted files and temporary files will slowly accumulate over time and take up space on your device. 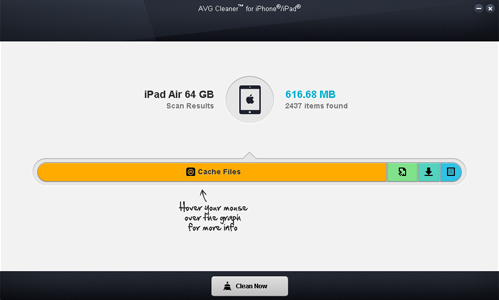 Luckily, a quick scan from AVG Cleaner™ will find all of that junk data and show you where it’s hiding. Connect your Apple device to your PC and click on Clean Up iPhone, iPad or iPod touch. Then, hit the Scan Now button and have a look at the results. App Cache and Temporary Files folders which contain data that‘s needed while the app is running. This includes, for example, downloaded map data that you looked at when you were on your last vacation, videos you streamed using a YouTube app, and temporary files that can be created from scratch if the apps really need them. System Logs that are created and forgotten after an app crashes. Thumbnail files which are created every time you browse a photo related app. These are used to display the little previews, but the app may forget to delete them when they’re no longer necessary. While you’re cleaning up your device, AVG Cleaner will show you just how much the free space represents in new photos, videos, songs or apps you can store. Ready to clean? Then hit the Clean button. In our tests, we found 7,55 GB on a 1-year-old iPad Air! Your iPhone, iPad or iPod touch should now have more free space. When we put AVG TuneUp hard to the test on both really old and brand-new machines, we were amazed at the results. Want to find out how these performance features were able to speed up browsing the web, playing games, watching movies or working with Office?